The search to achieve the American Dream: Book Reading on Thursday, April 26, 7 pm at Elliott Bay Book Co.
Mike Muñoz, has done a lot of waiting for something in his life to change. After high school he is still doing menial work and was just fired from his lawn boy gig. Mike knows to change his life he is the one that has to make a change. He tries to make it out of the societal hole he was born into, only making it deeper with his own mistakes. However, he is determined to make the world know he exists. Follow the journey of Mike Muñoz and learn a lesson on human will and power to overcome destiny. 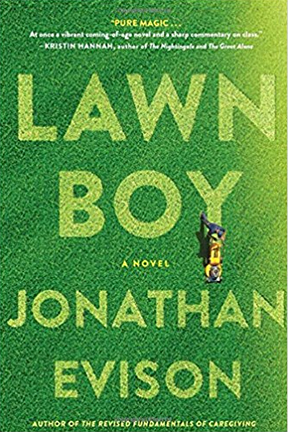 Jonathan Evison is doing a book reading of Lawn Boy at Elliott Bay Book Company, 1521 10th Ave, Seattle, WA 8122 on Thurs April 26 at 7 pm. Check out books like this in the Popular Reading Collection! This entry was posted in Events, Popular Reading Collection. Bookmark the permalink.